Great thread Keith. I spose I'm of the opinion that if the 'Island' is redesigned to go faster, I still won't be racing to my dealer to update. There seems to always be a tradeoff with gaining speed. ie: make it lighter by using carbon fibre and the price goes through the roof or make it lighter by using less plastic and the strength is reduced. Add more sail and the simplicity and stability features are affected. etc. Sure there is always room for performance improvements and a reshape of the hull may gain an extra knot or 2, but for me the Island ticks all the boxes that I need ticking, is a weekend stress relief and once I hit the water, I never seem to be in a hurry to get anywhere. Personally, I'm pretty happy with my package. I think you are spot on NOHUHU - and in fact Hobie does own that space already - the Hobie trifoiler design still holds the A class world speed record of 43 knots it set over 10 years ago. 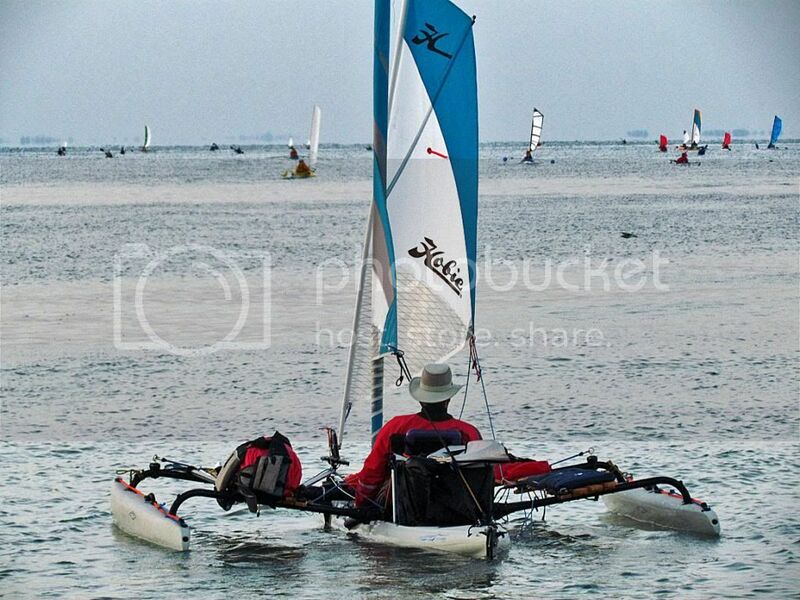 If Hobie wanted to make the AI/TI faster or build a different faster trimaran they already know how to do it. The fact is AI and TI boats are nothing short of amazing with their combination of multi-purpose configuration ability, ease of setup, learning to use, handling, and transportation, plus multiple propulsion capability with easy maintenance and low cost. Its why we all have them of course. And Hobie knows it. 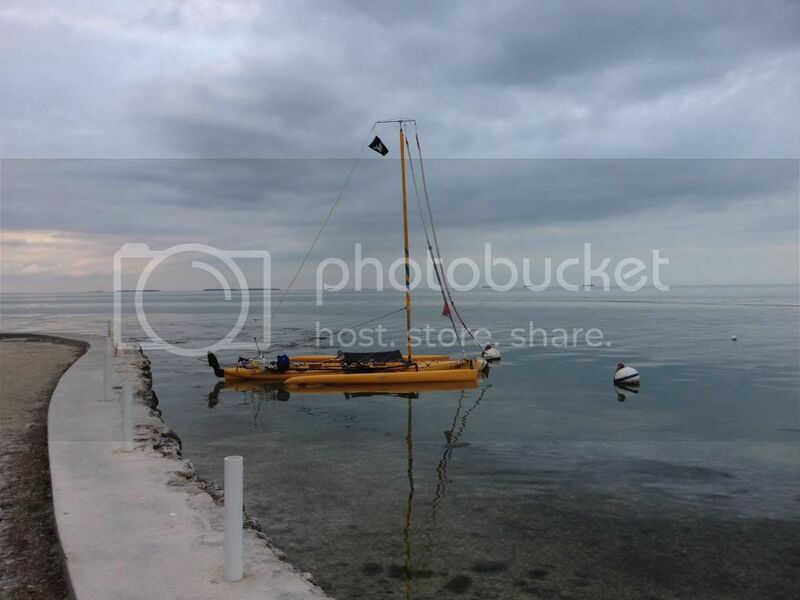 Like most on the forum I'm sure I will never stop looking for tweaks to these boats especially to attain a drier ride but I think it would take a major re-design to attain substantially higher sailing speed and then it wouldn't be the same boat anymore. Disclaimer: I am not a boat designer. I'm just talking--it is free. I think what the traditionalist on this thread need to get by is that there can be a faster, drier AI w/o sacrificing a lot. Here is Randy Smyth's boat on the start line at the EC2013. The new AI, the AI Magnum, needs to be longer so it can carry a jib. It needs to have some rocker so it does less cutting through waves. It needs to be more narrow for speed. I like the idea of flat, slightly rockered amas--they would probably be pointed in the front to cut through waves and come up fast. Likely, the one thing that will suffer a little will be the "Adventure style" fishing kayak. Frankly, I fished out of my 21"-wide Current Designs Extreme (now "Nomad") for years. I hooked sharks, tarpon, and lots of other fish, and I never felt in danger of capsizing while I was fishing. Of course, the new AI Magnum in Adventure mode could carry some sponsons if worried about capsizes. One thing I have noticed personally, is that I am doing more fishing in the AI-mode, and less in the Adventure mode. It is not as convenient for fishing a mangrove island shore line, but the AI-mode is great for getting to your fishing destination. The TI design is fine as long as a couple minor things are taken care of before adding all the extra sail. First off the bow on the TI is very weak (because of the big hatch opening so some sort of bow re-enforcement is needed. Second the main sail is mounted so far forward that unless you add a bow sprit you cannot get enough air into your front sails. The bow sprit also helps lift the bow so it no longer dives (because the angled sails help lift the bow). It works so well I was able to remove the hydrofoils, don't need them anymore. My jib is worn out now so I've got it cut back to about 22 sq ft but it still helps a lot. I'm in the process of designing and making all new sails right now. The new main and jib sails will furlable soft wing type sails. And I will convert the G2 spinnaker to a g1 spinnaker (screacher like on the Weta). The G2 spin is still good for down wind but will be deployed from a halyard and sail bag when needed (screachers are not so hot on downwind). By going to wing sails the side force when in a reach will be much less and I should be able to show more sail in a reach with them. I also plan to extend my AMA's 1 additional foot on each side so the boat will be 12 ft wide (vs 10), this should give me the correct flotation needed and will also raise them up a little higher. With the current centerboard and the new rudder system there is no problems with steering, I try to trim the sails so the rudder remains neutral (less drag that way), but the boat still has a tendency to try to round up when pushing it, however I can sail much closer to the wind than most boats. Of course the mast has to be stayed from the rear because of all the extra sails, and I had to add a small brace on the bottom of the hull at the mast base to lessen the force on that tiny 1/4 stud at the base of the mast. Also because the boat is pushing much harder and much faster the nylon sheer bolts are no longer strong enough by themselves to not sheer when you bury an AMA at 18+ mph. I have a simple rope connecting the 2 AMA's that prevents them from rattling around and possibly coming off. Once I extend the AKA bars I will add another rope to hold the AKA's straight in a Y shape like a truss. I've also been thinking about adding another tramp for the rear seat area in a triangle shape so you can hike out in the rear seat. Though I mostly solo from the front seat, there is a definite advantage to keeping as much weight as possible to the rear, unfortunately you cannot hike out from back there currently, I can run all my sails from either the front seat or the back but it's a pain to un-cleat the sail lines in the front while in the back so I may add another group of 4 Harken cleats to the rear AKA brace. As far as the tiller goes, it's not a big deal to add an extension pole with a rope loop on the end so you can steer while hike out. Total cost for all my mods (not including the gas motor) was around $300-350 bucks and I made all the stuff in my garage with just basic tools (hacksaw and drill). I have not made any changes at all in the last couple years, I just take the boat out and use it most every weekend in pretty much any conditions. If we are planning a river adventure I just leave the sail gear at home or back at our campsite. I design and build all my own sails which is not difficult if you read up on it and your wife has a nice top of the line sewing machine, as long as you do the sewing while she is at work she will be none the wiser. I consider my boat to be unique in the way that there is no other capable 18-21 ft boat on the market @200 lbs that you can car top and rig in about 30-40 minutes, then store it in your garage. We have a camper when traveling so the hitch is already used, and live in a restricted community where no trailers are allowed to sit in your yard. We often go out with at least 3 adults on board and have gone out with 3 adults and 2 kids (5 people), I keep 6 PFD's with the boat. I have sailed around many Weta's and windrider 17's and both have to have a trailer and both take a lot longer to rig. Plus the WR 17 is over 400 lbs (it's a monster). All 3 boats are a wet ride because you are up close and personal to the water (the way I like it). What would I suggest to Hobie to improve the TI, nothing at all, the boat is an engineering dream just as it is designed. If they wanted to offer a kit to make it into something like mine they could easily. The bow brace I made is very similar to the one Jim (Hobies chief engineer) used in EC 2011, I only added a 3 ft fiberglass pultrusion bow sprit to the brace to get the fore sails further forward and so they provide some lift for the bow and that's it. Adding a brace at the hull bottom at the base of the mast is a super simple mod, that re-enforces the mast base enough to support the additional sails (side to side bracing is sufficient from the factory). Of course the rear stay line is important to help counteract the forward force. On my first TI I re-enforced the mast to make it stiffer, but on #'s 2 and 3 I didn't bother, I like the ability for the mast to flex to spill excess wind. I have not snapped a mast yet, and have been out in pretty bad conditions many times, as with any sailboat if you put too much sail out in bad conditions something will break, you just have to use common sense (don't put your huge spinnaker up in 25 mph winds DAH, (though I have done it in 20mph plus winds a few times). I have made no modifications to the TI hull at all, everything just plugs right onto the factory boat (the extra brace at the base of the hull is easily, removed, and the bow sprit/brace just bolts to the front AKA cross bar and is held down to the bow front by straps). I often lift the front of the boat by the bow sprit to load it onto the car. The furling mast topper is super simple and just slips onto the existing mast, and you can still put the sails up and down on the water if you come to a low bridge. 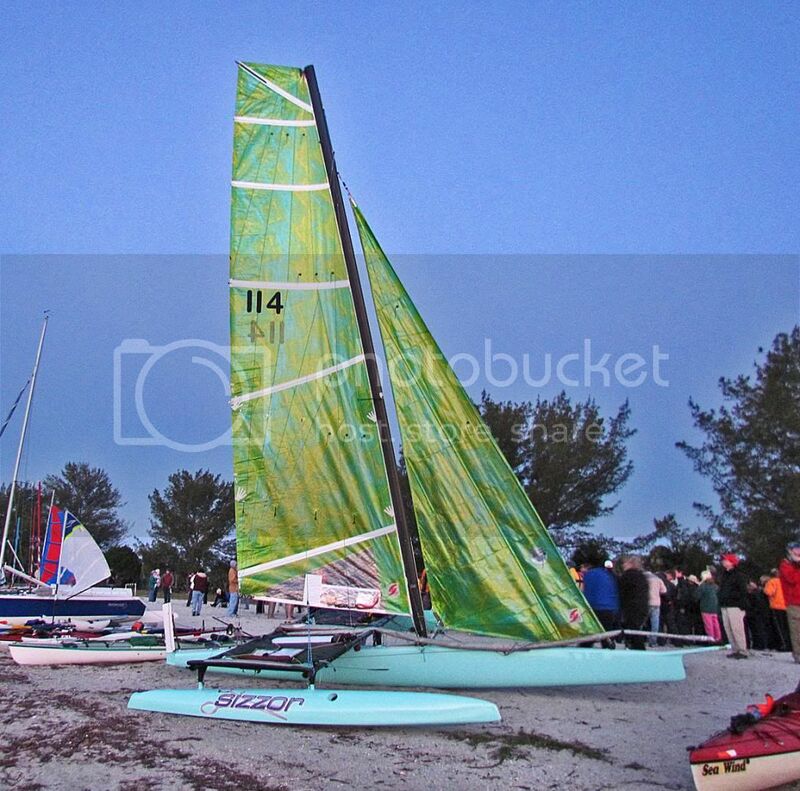 If I were Hobie I wouldn't change a thing, I would just start offering a kit just like they do on their other boats, they could probably use existing sails (like h16 sails). Though a screacher like on a WETA or WR17 (which they don't currently offer) would be desirable. Small insert to drop behind the mast base on the bottom of the hull. Mast topper similar to mine. All the additional harken blocks and sail control lines (the boat already comes with all the necessary tapped holes for the additional harken hardware). 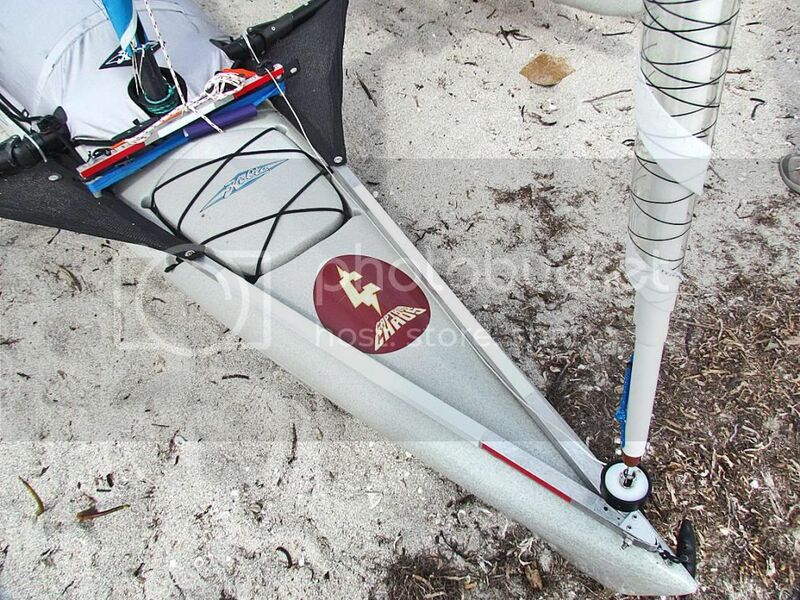 Nothing else is needed, the boat can still be used as a basic TI or as a kayak, just leave the extra rigging at home, though I have never done that, once you have it, you won't go out in the water without it. I know I'm having the time of my life with this boat and it performs flawlessly in pretty much any conditions as long as you use your common sense. That's my wish list, I would think exactly the same could be done with an AI. Hobie will this be ready by Xmas. The TI design is fine as long as a couple minor things are taken care of before adding all the extra sail. What would I suggest to Hobie to improve the TI, nothing at all, the boat is an engineering dream just as it is designed. If I were Hobie, and I could make an off-the-shelf AI Magnum that (1) the average 60-yr old guy/woman could lift onto his/her SUV, (2) would have the speed of a current TI or better, (3) could be used on week-long expeditions and fishing trips, (4) would be a drier ride than the rear seat of the TI, (5) would be as simple and trouble-free as the current AI, and (6) at a price 10-20 % higher than the current AI, I would get that on the market ASAP. PS Warning: putting an AI/TI on top of your vehicle, straight out of salt water, is condemning your vehicle to a lingering, but certain death by rust. Keith funny you should mention that about the rust on your car. I just took our Denali to the dealer this morning with a small rust spot on the roof. I told them there must have been a ding in the paint from branch falling onto the roof or something (or possibly hauling kayaks all the time, but I didn't share that with them). They assured me that this is covered under the 5 yr rust through warranty on the vehicle and to schedule an appointment to have it all fixed for free. I do try and make sure the boat is dry and clean before putting it up on the roof, I wipe it down with an old beach towel to get the sand off before loading, then as soon as I get home I try to hose everything off (including the car). 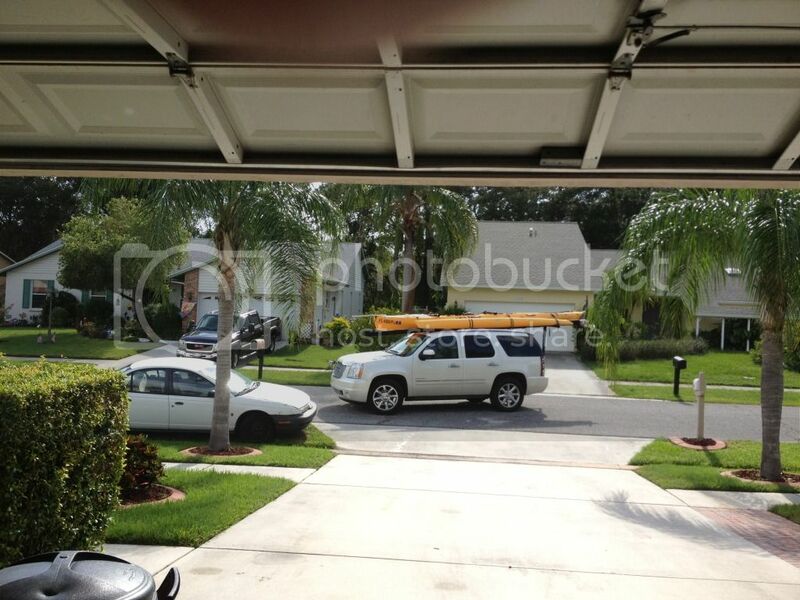 This is now our 3rd kayaking hauling vehicle, we wore out the other two. Bob, I couldn't resist my post, but I recognize the great things you have done. I couldn't begin to do them, especially lifting a TI (even an AI) on top of my 4-Runner. I've already rusted out 2 vehicles by loading sea kayaks on them. That is why I put that warning in. Fortunately, nobody has complained about my kayak trailer in my yard. I just got back from the dealer, they told me they have to completely replace my whole roof, they ordered the new roof today, once they get it in it will take two weeks to replace it, fortunately they give me a loaner car during that time. It's all covered under warranty, but I will be stranded without the ability to transport my kayak for two weeks (yikes). There really is something too your statement, so I promise to take better care in the future, no more leaving the kayak on the roof for 3 months at a time. I had no idea it was that bad. I'm not a big guy, in my 60's, when I get to my 70's I will likely have to go to a trailer. 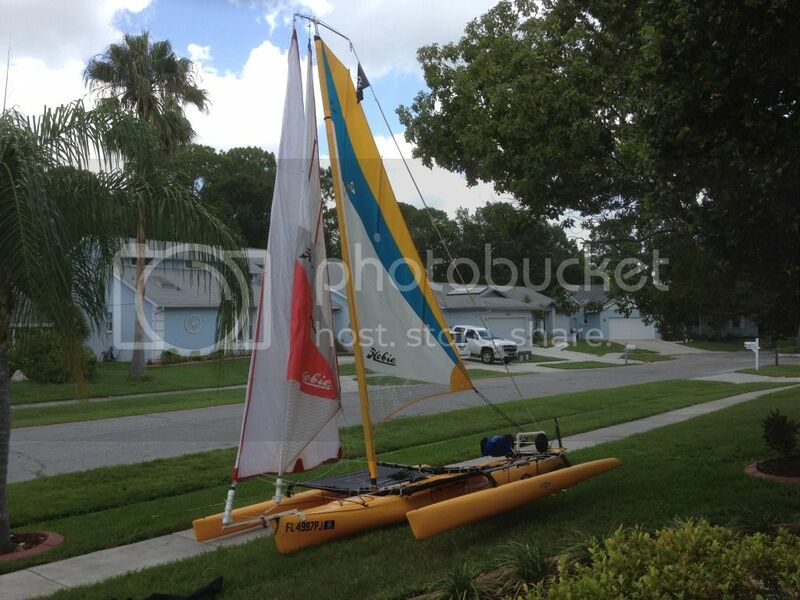 Who knows if Hobie releases a Magnum AI, I may opt for one of those for when I'm out solo. Hawaii is a petri dish for rust. And I live near the beach. I used to leave the AI on the roof a couple days a week in the garage and also store it (inverted) over the car on a hoist. Despite religious washings, it trashed the paint in those areas, especially those that were exposed to sun and a little rain. The water that dripped out of or off the stern was one obvious source of the problem. Even when it looks clean to you, you'll never get all the salt, water and sand out of every part (including the racks) and they have no place to go but down. On the paint, past the moldings and into the seals. In less than 2 years of cartopping, I was seeing patterned paint failure and oxidation that I never experienced on any of my immaculate vehicles. Thanks for bringing that up Keith. Now back to the Magnum AI debate,.. However, just remember Bob, make sure the wind speed doesn't exceed 5mph!!! fusioneng wrote: the bow sprit/brace just bolts to the front AKA cross bar and is held down to the bow front by straps). I often lift the front of the boat by the bow sprit to load it onto the car. Thank you for the full detailed description. It helps me to see what is possible and gives me some ideas for lesser mods. Here is an image of CaptnChaos' (aka Jim Quinlan) hardware to attach his jib. This hardware and his jib work very well. So from the picture it looks like the brace is fastened to the akas aft, and forward to the two little screws holding the forward handle. Doesn't that mean that much of the force of the wind is transmitted to the hull through two little screws holding on to some plastic? I've been nervous just lifting an empty bow by that handle because I don't see how it could be strong enough. And doesn't Hobie put a caution in the manual about putting too much faith in bow and stern handles. What am I missing? I'm sure Jim can speak to that. For myself, I often pick the bow up by the bow handle--I have put a second handle on that pad eye for a 2-handle pick up--that is usually to drag the boat up/down the beach. When putting the boat away, if my wife is around, she takes the bow and I take the stern. Both of us use the handle to start the lift, but support the boat with the second hand underneath the boat. If my wife is not around, I store the boat by picking it up with the handle on the gunnel.